For any nation to exercise its National will to pursue its National interest, the Comprehensive National Power including capability and will to exercise hard power is inescapable. History reveals that no country ever became a major power without strong Defence Forces, having the desired military capability and high morale to fight. The successful surgical strikes on “Terrorists and their supporters” by synergized actions of all elements of National Power backing Indian Armed Forces, demonstrated the National Intention, Will, and Capacity to exercise hard power, to break Pakistan myth that India will not chase militants and their supporters across the LoC/IB due to nuclear hangover, propagated by them. At that point of time the nation stood as one entity, and the national resolve was very heartening for morale of Defence Forces. Unfortunately, the continued politicisation of the action by various interest groups thereafter, in forthcoming election fever, including the suicide of a veteran has been disheartening, as it lowers their morale. Defence Forces need to be left out of politics of any kind, to do their professional job. On 14 October 2016, while inaugurating Shourya Smarak, Honorable Prime Minister, who represents 125 crore Indians, mentioned that “The Army does not speak, but displays its valor”. (Hindu, 14 October 2016). Boosting Defence Forces’ morale, with a feel that the nation stands behind them. Relating it to military credo, the first inviolable teaching of the Army to soldiers is that ‘The security, safety and honor of my country comes first always and every time’. As a nation we are confident that our Defence Forces will always live up to it. The second teaching to its leaders is that ‘The safety, honor and welfare of the men I command comes next, always and every time’. It is with this passion, as an old military leader, I wish to highlight that the National Decision Makers needs to look after the honor and welfare of its Defence Forces, so that they continue displaying valor without speaking. In this regard there are some glaring issues, which need to be highlighted. Since the declaration of 7th Central Pay Commission (CPC), there has been spurge of misinterpreted articles/ news reports/ debates on NFU, Disability Pension flashing misinterpreted statistics, trying to indicate that Defence Services are fighting for extra money, missing the point of honor, pride and status, related to some of these issues without understanding their connection with financial figures. Let me highlight some such issues. Gradual Degradation of Status vis a vis other Central Government Employees. Many decades back our Nation builders gave a minor edge in status to Defence Forces over all other Central Government Services by giving an advantage of Rs 50 in basic pay over. The amount may be insignificant, but it gave a feeling of pride that the Nation looks at you as instrument of last resort in any adverse situation. In subsequent decades, the smart efforts of Civil Services to erode this edge and overtake Defence Forces has succeeded, due to power of proximity to Decision Makers, and opportunity to produce unchallenged interpretation of statistics generated by them, to an extent that it has snowballed from Third CPC to touching Defence Forces Sentiments (Status, Honor, and Pride) in Sixth and Seventh CPC. The same thing continues even now with MoD circular of 18 October 16, cleverly pulling down the status of military officers vis a vis their civilian counterparts further, which was later explained as merely formalizing functional equivalence by Raksha Mantri on 27 October 2016,while briefing the media quoting similar moves earlier. It needs to be understood that in few years’, the civil services will easily convert this so called functional equivalence into precedence amongst ranks quoting this circular, as they have quoted older ones to push this through, and have been successful, even when nation’s sentiments are with Army trying to build their morale and politicians applauding them every day, but allowing this to happen. While all Central Government employees are provided 40 pay scales, the defence personnel are graded/ bracketed only in 24. This restricts the opportunity of greater salary hike. (India.com News Desk 13 August 2016). Military pensions which depend on pay scale need to be higher than civil counterparts on account of early retirement and hazards of service life. The pay matrix fixes the pay scale purely as per the educational qualification at the entry level. The Defence Forces need soldiers, who are physically tough to be able to withstand hardship of battle; hence their selection necessitates twin qualifications of higher physical and medical fitness, besides education, which cannot be compromised for effectiveness of the Defence Forces. The matrix therefore gives no credits to higher physical and medical fitness and most soldiers at entry level get labelled as ‘Semi-Skilled’ suffers the carryover disadvantage of being fixed at lower pay scale. There is a national compulsion of maintaining equitable representation in Defence Forces from all corners of the country as per recruitable population, hence some soldiers with lesser educational, meeting all other qualifications, who can make good soldiers from areas, where education facilities are lesser, cannot be eliminated. This is against Army and National interest, to eliminate physically tough young men, and increase entry level to graduation to get higher pay scales. The article does not recommend new pay matrix, but recommends one step jump in pay matrix on account of twin qualification needed. It is therefore an issue of status of that soldier, who is not happy to be equated as semi-skilled labour. On recruitment the Defence Forces carry out their rigorous training to make them capable of highly technological and extremely costly equipment of the nation like tanks, missiles, guns etc, a skill which is rare, and need to be recognised. It is therefore recommended that without altering the pay matrix of 7th CPC, the soldiers after recruit training must be upgraded from ‘Semiskilled’ to ‘Skilled’ and put in the corresponding pay scale. The Junior Commissioned Officers (JCOs), who are a Class Two Gazetted Officer, with much more experience, need a pay scale in keeping with their status as Gazetted Officers. They being bracketed with soldiers is a dent in their status. A case in point is their being grouped with soldiers for military service pay (MSP). The Defence Forces demanded MSP for JCOs to be Rs 10,000, yet in 7th Pay Commission, the JCO’s clubbed with jawans, have been given only Rs 5,200 ((India.com News Desk 13 August 2016). The OROP Issue. OROP by definition means that everyone retiring at same rank with same length of service should get the same pension. What has been granted is one rank five pensions, hence the person retiring latest will always get more pension. A surprising part was one of the excuse given, that Government Servants find it difficult to calculate it on yearly basis for military, (have no problems in calculating in Yearly calculation for civil services), in this hi tech age of today, when every bank in the country can calculate the interests of customers on hourly basis, and we are looking for digital India! One of the most sensitive issue for the officers of the Armed Forces is non grant of NFU to Defence Services, which is resulting in lowering of their status/Izzat, vis a vis other Central Government Services, which is disappointing them even more than lowering of basic pay. The 6th Central Pay Commission had conceived NFU only for Organised Group ‘A’ Services, subsequently it was extended by Government to All India Services (AIS). As of now Defence Officers, (who traditionally had a higher status than all other categories of the Central Government Employees, including AIS) are the only ones denied any form of assured financial progression (NFU for AIS/Organised Group ‘A’ Services, Modified Assured Career Progression (MACP) for Group ‘B’ and ‘C’ employees including JCOs/OR, FCS for Scientists, DACP for CHS Cadre). This is despite the fact that the Defence Forces have the poorest promotional avenues due to steep pyramidal structure (which is a need for its effectiveness in combat), most adverse cadre ratios to the extent that only 0.82% officers reach Major General and above. Additional increments to IAS officers in middle service, further increases the disparity between military and civilian officers. The eligibility of Defence Forces for grant of NFU, or similar dispensation thereof, in 6th CPC, has been clearly acknowledged by the 7th CPC. Even the Chairman 7th CPC has recommended grant of NFU for the Defence Services (Paragraphs 7.3.25(e) and 6.2.35 of 7th CPC Reports refers). Without putting the clock back, it is a highly justified need to seek notional grant of NFU in 6th CPC regime, to ensure correct migration and pay fixation in 7th CPC, applicable to both empanelled as well as non-empanelled Officers, on similar lines as being applied for the Civilians. How is Status, Honour, Bride and Parity with Civilian Counterparts affected by denial of NFU? 100 % Organised Group ‘A’ Services & AIS attain the scales of Senior Administrative Grade (SAG)at 20 years of service and Higher Administrative Scale (HAG) in about 27 years of service, irrespective of the post held. In Defence Services, SAG Scale is achieved only by 0.61% that too at 32 to 34 years of service, and HAG Scale by 0.18% after 36 to 37 years of service. In Civil Services, the relative status gets governed by pay scale; hence it results in relative lowering of status. The benefit of NFU has been extended to all the Group ‘A’ Services like Indian Defence Service of Engineers (MES) , Border Roads Organisation, DRDO, Ordnance factories and many more, which were operating with Defence Services in a supporting role, hence were traditionally placed at lower scale. This NFU uplift to them has adversely affected the command, control and functioning of Defence Officers working with them, leading to sub optimal output and embarrassment of Defence Officers on regular basis. The disparity gets further magnified due to the fact that NFU has been operational for over a decade for AIS/Group ‘A’ Organized Services, hence during transition to the new pay matrix recommended by the 7th CPC, the Defence Services Officers will transit to much lower pay levels . Thus, Defence Services officers get doubly disadvantaged, i.e. firstly on account of denial of NFU for a decade and secondly by transition to lower 7th CPC scales. Command and Control within Services. There is a myth generated that it may create Command and Control problems within Defence Forces. The fact is that Primacy of Rank is paramount in Defence Forces, as some non-empanelled Officers, having longer length of service than their superior Officers, draw higher pay even without NFU,which has not clashed with Command and Control within Services. In fact a large number of Brigs draw more pay and pension than Major Generals (An anomaly of earlier pay Commissions, which arose by not granting MSP to Generals, with no worthwhile logic, and has not been rectified so far), yet I have not come across a single Brig, who does not want to become a Major General, knowing fully well that his pay and pension may reduce by his promotion. This further proves that NFU need is more for the status, pride and morale of officers, (affecting Col’s and Brig’s more than other officers), and financial benefits through NFU realistically are very minimal, not posing heavy burden on taxpayers of the country, as the NFU of Civil Services is doing, where everyone got a jump up to HAG scale before retirement, without anyone making much noise about it. To restore the dented status and pride of Defence Forces, a very practical and implementable option is to grant NFU on notional basis in 6th CPC regime for correct Pay Fixation in the 7th CPC. Government can subsequently take a call on continued grant of NFU in a manner that either it’s given to all, including Defence Forces or to none of the Central Government Services. The recommendation of 7th Pay Commission Report to shift from ‘Percentage System’ to ‘Slab System’ will reduce the disability pension of maximum disabled military men very significantly in comparison to all the Central Government Employees for the same disability, which is extremely detrimental to the morale of Defence Services, because when a soldier (officers included) goes for any operation, he does not worry about death, but he definitely prays not to come back as a liability for his family for rest of his life, by getting disabled. After declassification of 7th Pay Commission Report, a number of motivated articles appeared in media demeaning the Army officers on this issue, by misinterpretation of one sided statistics, and quoting of a two year old letter by then DGAFMS to Defence Secretary (Hindustan Times, 18 October 2016), indicating that senior officers are using their influence to get into disabled category to get its benefits. Let me attempt to clarify some myths about some of these issues, as an old soldier. Shifting from Percentage System to Slab System. The myth that it will bring more equity amongst ranks. (Times of India 12 October 2016). The myth is a misplaced interpretation because every military soldier irrespective of the rank will be entitled to a fixed amount, whereas for the same disability every Central Government Employee will keep getting increment with every increment in basic pay, putting all soldiers at ever increasing disadvantage for posterity. How can the nation expect soldier to swallow such discrimination? How can the nation expect a soldier to take risk of being disabled without worthwhile compensation, at least at par with civilians? It must be understood that equity amongst ranks is a smart cover move to disadvantage Defence Services, because the 7th CPC conveniently decided not to see as to why a Secretary with same disability must get much greater amount of disability pension in comparison to a peon with same disability to achieve equity? (India.com News Desk, 13 August 2016). Percentage of Officers disability is more than JCO/ORs. The common myth is that more percentage of officers are getting disability benefits than JCO’s/ORs, whereas in terms of numbers they suffer more casualties. The statistics given in Times of India, 12 October 2016, does not consider how many officers are disabled and how many JCO/ORs are disabled in terms of numbers. If the officers’ percentage is taken out of total strength of Defence Forces, the inferences will be different. The published statistics therefore may not be real, and seems to be misguiding. The facts are that the officer to men casualty ratio in Indian Defence Forces is one of the highest in the world, because they lead from front. The difference lies in the fact that service span of JCO’s/ORs is much less than officers, and they serve at much younger ages. The time span to get disabled therefore is much more in case of officers. As per the media reports, the Defence Forces have acute shortage of junior officers which is the cutting edge of military, hence they have to repeatedly expose themselves to risk, hence more prone to disability . Senior Officers using influence to get into disabled category. This myth has been based on the letter of former DGAFMS and misinterpretation of some statistics. Let me put some facts in place to clarify this myth. No military person irrespective of his rank can get disability category without personnel approval of DGAFMS and Ministry of Defence. If we go by published statistics quoted in Times of India, 12 October 16 itself, the percentage of the recipients of disability pensioners at Lt Cols and equivalent ranks is much more than Maj /Lt Generals in 2013. It is not understandable as to how junior officers can pressurise all medical officers, DGAFMS, and MoD. Going by published quotation of DGAFMS, if senior officers influenced their lower medical officers, as a professional how did him as DGAFMS and MoD came under pressure? The actions should have been initiated against first such senior officers, DGAFMS, and concerned MoD officials for allowing such practice, rather than releasing such letter close to 7th CPC, and punishing entire Defence Services by reducing their disability pension. In light of such contradictions the credibility of published views of DGAFMS letter appears to be a one sided and motivated. The physically and mentally tough activities which a Defence Officer goes through young age, more so due to acute shortage of officers and rigours of services, deteriorate the body much more rapidly consistently after 50 years and beyond 54 years,when it is only the senior officers who are serving, thus enhancing their probability of disability. The smartest move by Civil Services has been that they have been able to get all their allowances fixed as percentage of basic pay in various CPCs, which ensures automatic hike, whenever basic pay increases. The same pay commissions chose to grant most allowances to Defence Services as fixed amounts, so that they keep begging for hikes every time. There is an urgent need to apply the same yardstick for Defence Services, as for Civil Services. It feels demeaning to see a civil servant sitting in Jammu getting much more allowance than a military person posted on Line of Control or Siachin Glacier. The Defence Ministry’s decision to re-examine Civil- Military pay parity issue (Times of India, 29 October 2016) is welcome news provided it’s not a cover up move based on Committee of Civil servants, interpreting self-generated one sided data, to get over the current crisis in election dominated scenario, to come out with similar inferences after few months,when security situation stabilizes and military can be put out of the thinking radar of decision makers . The gravity of discontent among soldiers, as seen in social media must be understood, and addressed before it is too late. (The views expressed are personal views of the author and do not represent the views of any organisation. 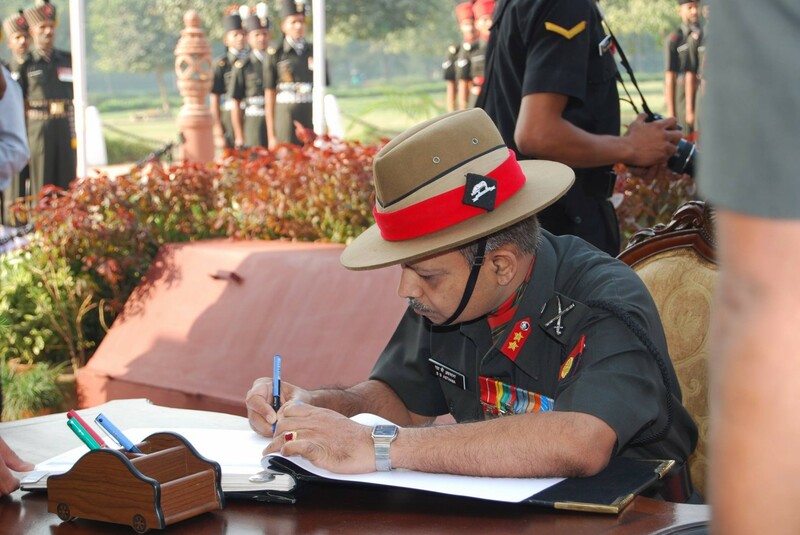 The author had been Additional Director General of Infantry with 38 years of military experience).